For me it was vocational retraining. After 20 years in the world of finance, and disgusted by the 2008 recession, I wanted to do something where I could work with my hands, and have the pleasure of physically creating something in my everyday job. There were two possibilities: either the wood industry (joiner/carpenter) which was extremely well developed in southern Belgium where I lived, or cuisine. The second option was easier to get into, and to make into a new career. I was already passionate about all things gourmet and an amateur chef and I think that all along the second option was, in reality, the only one. There is not just one moment, one favourite memory, but a whole succession of memories, sometimes difficult, but often happy which punctuated my experience at Le Cordon Bleu. To have finished top of the class three times in cuisine was an amazing personal achievement. I also have great memories of the excellent relationships I had with certain Chefs and students. However, my best memory is undoubtedly meeting the person who went on to become my wife and with whom I have just launched a new business. A week after graduating, I carried out an internship at Auguste with chef Gaël Orieux; my first experience in a Michelin-starred establishment. I immediately went on to carry out a second internship at l'Astrance (3 Michelin stars) with chef Pascal Barbot. It was extremely tough: the level, the working hours, the competition between the interns/commis. But I learnt so much and Chef Barbot’s greatest strength is his generosity, sharing and encouraging, enabling those who have the desire to progress. I was really lucky as I was able to extend my internship, which turned it into a real professional experience. To this day, L'Astrance remains the best experience I have ever had, both on a human level, with Chef Barbot, Christophe Roat, Alexandre and the others, and professionally. After l'Astrance, I carried out an internship in traditional bread making and making bread using leaven with Lenôtre, as I believe bread is a vital element – it can set a restaurant apart from the rest. After Lenôtre, I was taken on as commis de cuisine/pastry at Kei restaurant (one Michelin star) with Chef Kei Kobayashi. This was a good and lengthy experience both in pastry and cuisine and you don’t really realise quite how much you have got out of it until it is over. Technicality, stringency, organisation, Kei restaurant is a finely tuned machine which produces perfect dishes. This is a restaurant which is more than worthy of two stars if not more. Le Cordon Bleu, the internships and jobs, have only ever been stepping stones to my ultimate aim of being independent and creating my own establishment. Today, in partnership with my wife and a sommelier friend, we are opening our own business: Dili Gastronomy. Enjoy cooking! But be serious, organized, disciplined, modest and curious about everything. Above all, be aware that the diploma is just the first step in a very long and dizzying ladder. Separating the school and a kitchen brigade is a whole new world which the majority of students underestimate, or are completely unaware of. Tough, physical, sometimes brutal, a kitchen brigade is not an easy ride. So, you need to hold on tight with all your strength, be modest, curious and willing if you want to progress and climb the ladder. 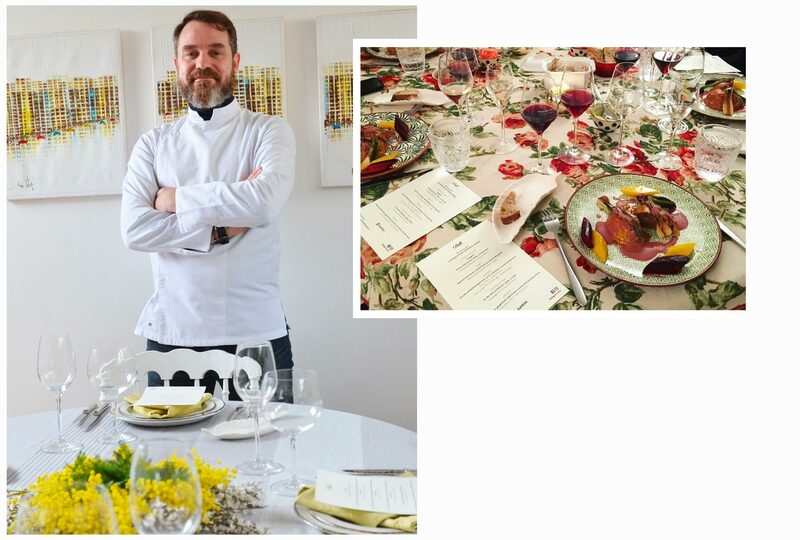 I am still in Paris and 100% focused on developing Dili Gastronomy, a concept based on private dinners with high-end gastronomic menus and food and wine pairing, all delivered by professional chefs and a sommelier. We strongly believe in sourcing the very best raw materials and working with them in-house. From the bread through to dessert, we make everything ourselves and serve it wines that we deem, along with our sommelier, to be the most appropriate. Dili Gastronomy is a top quality restaurant in a strictly private setting, without the constraints and formality of some of the best restaurants, providing a more relaxed setting and an opportunity for clients to have a more direct and intimate relationship with cuisine. To make Dili Gastronomy a success. A first business venture in my own right, built on what I have learnt and experienced. To build our reputation and continue to learn and progress. We will see what happens after that, we are at the beginning of our adventure.